Professor's Wayne Marble, Chris Handy, and Steve Jackson are the Brazilian Jiu-Jitsu Black Belt instructors at Blue Springs Jiu-Jitsu. 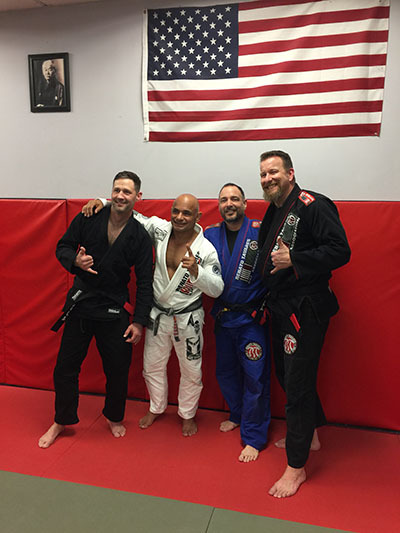 They received their Black Belts in Brazilian Jiu-Jitsu from Master Renato Tavares and Blue Springs Jiu-Jitsu is a part of the world renowned Renato Tavares Brazilian Jiu-Jitsu Association. Brazilian Jiu-jitsu is a unique art of ground fighting that utilizes grappling, chokes, joint locks and other submissions. Blue Springs Jiu-jitsu offers one of the most comprehensive BJJ programs in the Kansas City area. Master Renato Tavares moved to the United States in 2002. He currently oversees schools in 9 states and 8 different countries. We are very privileged to be a part of his association.